Practicing the Texas State Bobcat growl at Sayles Adobe, 2016. I am a child of Austin, Texas, and I’ve had a lifelong interest in the outdoors and in old things. After graduating from the University of Texas at Austin with a BA in anthropology, I moved west for archaeology work; I called the Great Basin and Mojave Desert home for several years as I worked in Death Valley National Park and in southern Nevada. I also worked in the pine forests of the western Sierra Nevada Mountains, on the Texas Gulf coast on a nautical excavation of a Civil War gunboat, and across that great big Paciﬁc Ocean, in New South Wales, Australia, where I worked on archaeology contract projects in advance of mining developments, mostly. For the past four years, I have spent summers with the National Park Service in Denali, Alaska and winters in Texas. Dr. Black has rightly described me as an itinerant archaeologist, and I describe myself as a generalist—one who is interested in learning about ancient hunter-gatherer people worldwide. This interest meshes well with the thesis research path I have embarked on—learning how the radiocarbon record can be used to inform our understanding of the past, both in broad strokes and ﬁne details. These updates are part of my education—an exercise in articulating what I am learning, and an opportunity to share what I am learning with the archaeology community and invested public. I hope that the newsletters will provoke you to ask questions about radiocarbon dating and how it shapes our understanding of the prehistory of the Lower Pecos Canyonlands. Some of this material will likely appear in an expanded form in my thesis. Hearts of sotol and lechuguilla roasted in an experimental earth oven. Were they to preserve for 5730 years, they would have half the 14C they had in 2015 when the ASWT team harvested them. In twice that time, 11,460 years, they would have 1/4th the 14C from 2015, and so on. Radiocarbon (14C) is an unstable isotope of carbon which makes up only a tiny fraction of the carbon in our atmosphere. Most 14C is created in the earth’s upper atmosphere, when thermal neutrons from cosmic rays react with nitrogen. After that, radiocarbon, and the other naturally occurring carbon isotopes (12C and 13C), react with oxygen to become carbon dioxide (CO2), and become distributed throughout the atmosphere. Photosynthesis is the primary mechanism by which carbon is incorporated into terrestrial plants. Animals intake carbon through the food chain. Fungi, that often overlooked kingdom, takes in carbon through decomposition of its host. Aquatic organisms are more complex; they take in dissolved carbon in ocean, lakes, and rivers. Therefore, aquatic organisms, and the terrestrial animals that derive a large part of their diet from aquatic resources, often date to older than their contemporaneous terrestrial counterparts. These differences in carbon levels in various environments are called reservoir effects; there are ways to adjust assay results to account for these effects. The important thing to grasp here is that radiocarbon dating rests on the idea that CO2, and therefore 14C, is evenly distributed in the atmosphere; aquatic environments aside, relative quantities of atmospheric carbon should be consistent around the planet at any given time. Though atmospheric carbon is assumed to be consistent across the planet at any given time, it is known that levels of 14C in the atmosphere vary through time. Amounts of 14C are effected by the earth’s magnetic ﬁeld, by solar ﬂares, by major volcanic eruptions, and, in more recent centuries, by the burning of fossil-fuels and by nuclear detonations. How are these variations through time accounted for? Dendrochronology (tree ring counting; annual growth in trees reﬂect environmental conditions through time, and tree ring sequences can be accurately dated by simple counting), and more recently, elemental measurements from corals, are used to establish calibration curves. Calibration curves correlate radiocarbon years with calendar or solar years, which is necessary for relating sample ages to most chronologies. Calibration will be discussed in greater depth in a future update. Prickly pear cactus incorporating carbon from the atmosphere through photosynthesis. Sample: the organic material which undergoes laboratory processing (e.g., preserved plant material, charcoal, bone, a fragment of a perishable artifact, even residues from artifacts). Assay: the laboratory process performed on the sample which extracts and measures the carbon. “Assay” is a noun and a verb. Date: a term often used loosely; a sample is not technically “dated,” it is assayed. The assay results are reported as a statistical estimate range of possible dates, in radiocarbon years before present (RCYBP, or often simply as BP) . δ (delta): indicates isotopic fractionation differences, and is reported with the conventional age [I’m still learning about this topic; it has to do with the ratio of isotopes and loss of lighter isotopes with time—it will be discussed in the future]. σ (sigma): associated with the statistical age range (the standard deviation from the estimated mean age). Standard deviation is expressed by a “±” followed by a number, which, when added or subtracted from the mean, indicates the upper and lower limits of the estimated age range. The σ will be given as 1σ or 2σ, which indicates the conﬁdence level of an estimated date range: 1σ deviation means that the actual age of the dated material has an approximately 68% probability of dating anywhere in that range. A 2σ deviation means that there is an approximately 95% probability; 2σ will always have a larger range of possible dates than 1σ. Conventional: normalized for isotopic fractionation (δ 13C) but uncalibrated. Reported as BP (before present, “present” being 1950 AD) which is actually radiocarbon years before present (RCYBP). In these updates I will use RCYBP when discussing conventional dates, for clarity. Reservoir Corrected: adjusted age to account for variation in the carbon reservoir (e.g., aquatic environments). Calibrated: accounts for variation in quantity of 14C through time, and translates radiocarbon years into solar or calendar years. Reported as cal BP, cal AD, or cal BC. In sum, there are several ways to express an age (e.g., RCYBP, BP, AD, BC, cal BP, etc.). These suffixes are critical to indicating what type radiocarbon data is being presented. The conventional age is generally regarded as the most essential age to report, as it reﬂects the 14C measurements of the sample, without which reservoir correction and calibration would not be possible. A corrected and calibrated assay, however, is integral to establishing chronologies, and for simply grasping how old something is relative to our own calendar system. This notation indicates that the actual age of the materials has a 68% conﬁdence of dating between 8910-8610 RCYBP (150 added to and subtracted from 8760). The 6810 BC date is the mean conventional age estimate (it has been converted to BC from BP by subtracting 1950 from 8760). Finally, there is a 95% probability the sample age falls in the 2σ range, in this case expressed in BC. The 2σ range of possible ages is several hundred years larger. Several pieces of information considered key today were not reported in the 1950s and 1960s. Calibration curves were not yet established when this date was published. Additionally, isotopic fractionation was not always reported. The TX-107 assay was neither corrected for isotopic fractionation nor calibrated when reported in 1965. As the sample was run on charcoal, a reservoir corrected age is not applicable. Previously reported Lower Pecos assays such as this one will be recalibrated, or in this case, calibrated and corrected for isotopic fractionation for what is likely the ﬁrst time, as part of my thesis. In this section I share my everyday experiences of learning about radiocarbon dating so that the reader can walk in my metaphorical radiocarbon footsteps. My journey began last winter, and was propelled forward by a couple of key experiences. One of these experiences was being invited by Dr. Raymond Mauldin and his colleagues at the University of Texas at San Antonio’s Center for Archaeological Research (CAR) to assist with a poster for the Society for American Archaeology’s (SAA) 2017 annual meeting. The poster presented an investigation of population patterns in Central Texas and the Lower Pecos Canyonlands, using large radiocarbon data sets from each region and comparing the abundance and distribution of dates through time. To this end, I contributed an initial compilation of 490 radiocarbon dates from the Lower Pecos. The bulk of these, 268 assays, had been assembled by Solveig Turpin and published in the 1991 study she edited Papers on Lower Pecos Prehistory. 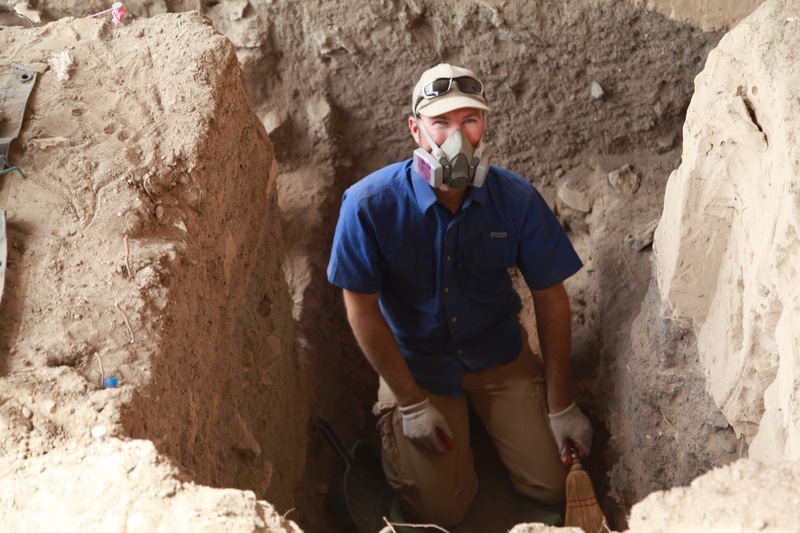 The remaining data, 222 assays, came from project reports and articles from the 1990s and 2000s, and from the Ancient Southwest Texas Project’s 2010-2017 excavations. The data were then vetted to eliminate dates with large standard deviations, because such dates are too imprecise for the requirements of the study. Data were also divided between samples from open sites (upland and terrace) and those from rockshelter sites, because preservation of organic materials differ enormously between these site types. In April, 2017 I attended the SAAs in Vancouver, BC, to help present the poster, and enjoyed my ﬁrst SAA conference experience very much. The other milestone in my Spring 2017 semester was writing and defending my thesis proposal. This was my ﬁrst opportunity to explore the application of the large Lower Pecos dataset to address archaeological questions. Potential research problems include increased use of earth ovens as a response to environmental change, spatial change in earth oven facilities through time, differential preference for sotol and lechuguilla, the uses of plants associated with earth ovens for non-comestible purposes (e.g., sandals, basketry, cordage), bison presence, and population ﬂuctuations and settlement through time. I suspect that there will be insuffcient data to meaningfully address certain of these topics, in which case I will highlight the need for further research. The Lower Pecos radiocarbon data set I assemble will be made available to other researchers through an online database. Several steps must be taken to prepare the dataset for analyses, including compiling the data needed, and correcting and calibrating the conventional ages. In addition, the archaeological context, laboratory treatments, and sample material will be critically evaluated to understand how the assay can (or can’t) be applied to addressing the aforementioned topics. In addition, I am rolling up my sleeves at CAR this autumn, where I am learning sample preparation methods from Dr. Mauldin. Some of the samples I will be assaying come from Eagle Cave, thanks to the generous contributions of the crowdfunding campaign! After initial processing at CAR, the samples will go to radiocarbon lab DirectAMS, where I hope to follow the samples through their ﬁnal carbon measurements. My present focus is on collecting and assessing contextual data at the Texas Archeological Research Lab (TARL), selecting additional samples from the ASWT excavations at Eagle Cave and Kelley Cave for assaying at CAR, and acing my statistics class so that I can do the analysis next spring. I am also working with the Center for Archaeological Studies at Texas State, where I am rehousing and cataloguing the spectacular Skiles family collection— an opportunity indirectly related to my thesis work, but which increases my knowledge of the material culture of the Lower Pecos, in particular the ﬁber industries. In the coming months I hope to relate to you my experiences in CAR’s radiocarbon lab. Thanks for your interest in my studies! Howdy! Justin Ayers here, excited to explain the ongoing bucket auger testing at Sayles Adobe. You may ask what exactly is an auger? The auger is a simple but effective tool for collecting/sampling sediment below the surface without opening excavation units. It is comprised of a lengthy pole with a helical bit (and cylindrical bucket) at the end, which is designed to twist through the earth easily, while the bucket simultaneously collects the sediment displaced by the twisting bit. After one and a half turns of the auger handle, the auger bucket is filled with compressed dirt, and the device is gently pulled up out of the hole and the bucket load is dumped into a screen, examined, and recorded. The process is repeated over and over up to a depth of 3 meters (about 10 feet!). Conducting a bucket auger survey of Sayles is important because it is allowing us to relatively quickly sample the stratigraphy across the terrace, a task that would take months to accomplish using hand excavation units. Further, by combining the different sets of auger data we are able to map out the subsurface deposits (both natural and cultural) of Sayles. These data will contribute to Tori Pagano’s ongoing thesis research (see Tales of Sayles Adobe), as she aims to define and sample the natural and cultural deposits of the terrace. Tori’s plan is to build on the ground-penetrating radar (GPR) survey conducted at the site in January by Tiffany Osburn. We wanted to follow the GPR grid with our bucket augering as closely as possible so we could investigate several interesting radar anomalies seen at certain locations and depths within the terrace. Happily, our collaborator geoarchaeologist Ken Lawrence kindly allowed us to borrow his bucket auger! East-west GPR transect (top) and west-east transect (bottom). The yellow arrows point to the same anomaly in both transects, indicated by the upside-down V-shape. This anomaly is approximately 1 meter (~3 feet) below the ground surface. These are the types of anomalies we wanted to hit with the auger testing. We wanted to use the bucket auger tests to begin to “ground-truth” the GPR anomalies (i.e., determine what the anomalies are caused by). We also wanted to compare the sediment sampled by the auger to the exposed stratigraphy in the “Borrow Pit” excavation area. The auger testing is showing us that the stratigraphy of Sayles Adobe is more complex (and interesting) than that seen so far in our initial excavation exposure in the Borrow Pit. You can see the bucket auger on the left, leaning against a tree. To the right you can see the rest of the equipment we used during auger testing: Munsell color chart, 2mm geologic sieve, 5-gallon bucket, and lots of recording forms! Step 1: Stake out targeted locations of auger columns. Plan map of Sayles Adobe showing east-west bucket auger transect. The red dots are the auger tests (laid out 4 meters apart) that have been completed thus far. The auger excavates a 10cm diameter hole, and each bucket full of dirt is ~8cm deep. Once a bucket of sediment is collected, the auger is pulled up to the surface. From left to right: auger in the hole, removing the auger, the auger fully out of the ground, and finally dumping the sediment into the sieve. Step 3: Sieve the sediment. Once the bucket is pulled out of the auger hole, it is dumped into a 2mm sieve. Only the fine sand/silt mixture will pass through the screen, leaving snail shells, roots, FCR (Fire-Cracked Rock), and debitage on the screen. Dumping the sediment into the sieve. The bucket auger bit is clearly visible. A metric tape (or “pocket stadia”) is used to measure the depth of the hole after each bucket auger sample was removed. This allows us to monitor our progress and make the auger data comparable from one auger column to the next. The sediment texture varies from a fine sand to a compact clay-silt. Color is recorded using a Musell color chart. We found that the 10YR color sheet works best for us. The sediment that falls through the screen is homogenized (stirred around) in the bucket before we collect a small representative sample. After the field season Tori, under the tutelage of geoarchaeologists Dr. Charles Frederick and Ken Lawrence, will process the samples to determine grain size and test for magnetic susceptibility (among other things). Tori plans to use the auger column data to create composite stratigraphic profiles (sections) across the terrace that will be integrated with GPR and other lines of evidence. A “cube” from the auger testing of Sayles Adobe awaiting further geoarchaeological analysis. I should note that while the bucket auger does its job very well, it mixes the sediment in each bucket load together such that thin layers only a few cm thick are hard to detect. And even though we are careful to insert and remove the auger gently, inevitably there is some admixture of sediment from the walls of the hole. In other words, we end up with somewhat averaged samples in 8cm increments. We homogenize each sample to make sure it truly represents an average of each increment. By carrying out each auger test in exactly the same systematic way, we can compare apples to apples with our auger samples and differentiate significant stratigraphic changes. Luckily Sayles Adobe has very nice silty and sandy deposits (as opposed to compact clay or gravel) and testing has gone without a hitch … for the most part. Sometimes we are impeded by rocks and roots, forcing us to move our auger test column to a new location. If we encounter something hard that we can’t get through, we simply move the auger hole 30-40cm over from the original location and try again. Overall, we able to get down to the full 3-meter depth in only about 50% of our tests. In the other half we are stopped by burned rocks or other obstructions (like large mesquite roots) before reaching maximum depth. Based on our initial excavation in the Borrow Pit area along with the GPR survey findings, we suspected that we would hit the upper mud drape (I will explain why I say “upper” in a bit) around the same depth at multiple points on the terrace (see below profile of the Borrow Pit in Sayles). The east profile of the “Borrow Pit” in Sayles. The “upper” mud drape is noted as S003, just to the left of the orange tag. So far we have found that the mud drape is not a perfectly flat horizontal layer, it tends to follow the topography of the deposits it covers. What I mean is that in places there may have been exposed rocks or humps in the ground that the mud drape settled over during the flood event, which may be the AD 1340 flood that we documented at nearby Skiles Shelter and Kelley Cave. Many (all?) of these rocks are FCR that were capped by the mud drape. The upper mud drape is thin and hard (clay-silt), compared to the fine sand and sandy silt that makes up the majority of the site’s deposits. In essence, the mud drape seals the cultural material that lies beneath it. Bryan standing in the “Sandbox” area at Sayles looking at FCR that he is just beginning to expoose. The mud drape in this unit (denoted by yellow arrow) is very thin compared to that seen in the Borrow Pit. Several adjacent auger columns in this area were terminated by hitting rocks and we suspect that some massive FCR accumulation must be present. Since the mud drape covers the top of the uppermost cultural layer at Sayles Adobe, when we reach the upper mud drape the cultural layer should be directly beneath it. However, this cultural layer contains many FCR and often the bucket auger is stopped by the rocks. The auger will dig through most Sayles Adobe sediment quickly, but when you hit a sizable rock … everything stops. This is not considered a bad thing though. Usually when we hit a rock, we bring up chips of said rock that reveal if it is FCR. The FCR fragments tended to smell of sulfur when broken by the auger bit. The FCR encountered about one meter below the surface tells us that we are hitting the upper cultural layer … jackpot! So far we have not created schematic stratigraphic profiles for all the auger tests, but we created a preliminary illustration based on a test from the east side of the site. The stratigraphic patterns in this auger test compare well to the stratigraphy observed in the Borrow Pit and Sandbox excavation, so we are anxious to complete augering of the entire site so we can get a better map of the stratigraphy! Stratigraphic profile created using data collected from an auger test. This profile matches nicely with the exposed stratigraphy in both the Borrow Pit and Sandbox areas of the site. Looking back at the GPR research done in January, the upper anomalies seen appear to have been the upper cultural layer. The FCR are in a large enough concentration to show significant feedback from the GPR. Three of our west terrace auger tests were stopped at a depth between 80cm-1m when we hit rock—usually FCR, which the auger could just not dig through. In fact, the Sandbox excavation area was laid out as the result of our first east-west bucket auger transect. Next week we should expose the concentrated FCR and see why so many burned rocks are piled up in one area. Auger testing at Sayles is an ongoing process, with more sampling columns on the way. So far, only an east to west transect has been completed. We just started on our north to south transect, targeting more anomalies from the GPR survey. If additional FCR/cultural layers are encountered, it is likely that more units will be opened up for further research. The emerging picture from the bucket auger data is proving to be quite informative and tantalizing. Hint, hint: we have encountered deeper layers of mud drape silt and of cultural material yet to be exposed! Tori and I very excited about a flake from an auger test! Most of the previous ASWT blog posts have focused on our ongoing excavations in Eagle Nest Canyon, with a few thrown in about earth ovens and our undying love for burned rock. So I thought it was time for a little change of pace! This post highlights another very common archaeological feature found in many of the sites within Eagle Nest Canyon and elsewhere across the Lower Pecos Canyonlands —ground stone bedrock features. Bedrock features, as I will often refer to them, include “slicked” areas, shallow grinding basins, deep mortar holes, and everything else in between. Amanda cleaning off bedrock features. I first became interested in bedrock features during my tenure at Shumla Archaeological Research and Education Center. We went to rockshelters across the region to record rock art, and bedrock features were a common occurrence in many sites. Most intriguing were bedrock features that were over 50 cm deep. I thought to myself, what on earth were the Lower Pecos inhabitants doing with these features when you can barely touch the bottom with your fingertips? Further, despite the ubiquitous nature of bedrock features in the Lower Pecos, they represent a largely understudied part of the archaeological record. In part, this is why I chose to explore this prehistoric technology for my recently completed Master’s thesis at Texas State University. A volunteer demonstrating the great depth of some of these bedrock features. Neither hand can touch the bottom of these two bedrock mortar features. Archaeologists typically categorize these features by morphology and the perceived type of activity (e.g., pounding, reciprocal grinding, circular grinding, etc.). For example, grinding facets are shallow basins likely used to grind foods with a back and forth or circular grinding motion. Mortars are deep holes that were utilized for crushing or pounding, probably using straight up and down motions or possibly rotary or circular motions in some instances. Lastly, “slicked” areas are flat surfaces that have a shiny, smooth appearance and their function is unknown. The highly polished surface could be the result of multiple activities such as polishing hides or another activity that might include oily substances. Ethnographically, bedrock features of all shapes and depths were used for a variety of activities, mostly related to food-processing. While generic terms, such as the ones listed above, have been used in previous bedrock feature research around the world, prior to my study there had not been any bedrock feature research completed in the Lower Pecos. Therefore, I was most interested in creating a baseline data set of the morphological variation of these features. In other words, are we able to pick out any unique “types” of features and how are these morphologies distributed across the landscape? Further, using other lines of evidence such as use-wear patterns, can we determine what kinds of foods were being processed in these features? Essentially, I wanted to take a broad approach to my research and try to gain a better understanding of how these features were utilized by the hunting and gathering peoples of the Lower Pecos. For my research I recorded morphological attributes (e.g., shape/size), use-wear characteristics (e.g., wear patterns left behind on the rock from different processing activities), and metric data (e.g., measurements) for 824 individual bedrock features at 10 sites using a combination of Structure from Motion (SfM) Photogrammetry (see SfM Revolution) and traditional field documentation methods. I recorded morphological attributes and macroscopic use-wear patterns using the form below. I used SfM as the primary mapping and documentation method for each of the bedrock features I recorded. From the 3D data, I was able to create high resolution feature maps, and gather measurements for each feature in the mapping software ArcGIS. Examples of feature maps created via SfM and ArcGIS: a) orthophoto of surface; b) a digital elevation model (DEM) of the same surface; and c), a slope model of the same surface derived from the DEM. I focused the majority of my analyses on three different measurements: maximum depth of each feature and two axes across the opening of each feature. To summarize my results, I completed a cluster analysis using the metric data, which resulted in four distinct groups of bedrock features. The majority of the features (97%) fell into one very large, closely related group. I should note that Cluster 1 was comprised of four smaller subgroups, but there is only so much you can do for a M.A. thesis and still finish in decent time (as my committee wisely advised me!). The remainder of the bedrock features formed three smaller groups. Looking at the graphic below, it’s easy to see how some of these groups were formed. Cluster 4 features are all extremely deep, between 40 and 60 cm. Cluster 2 features are moderately deep, between 20 and 30 cm. However, there are pieces of the puzzle the graphic doesn’t show. For example, the majority of Cluster 4 features have completely straight/vertical walls, while Cluster 2 features have sloping walls that form an overall conical shape. These types of observations were exciting because they are diagnostic attributes of these clusters that are independent of the cluster analysis. Said differently, they support the distinction of two different cluster which also had two different activities going on. As for Clusters 1 and 3, they seem to blur together in the above chart. The reason for this is that Cluster 3 features are defined by at least one considerably long axis at the opening of the feature. Looking strictly at the length of the axis measurements, Cluster 3 separates itself from the rest of the sample. Cluster 1, in both graphics, is all over the map. This cluster contains a very wide range of variation in all aspects of the feature, depth, length, and width. So essentially what the cluster analysis had shown me is that there are distinct morphological groupings of features, and each had a diagnostic characteristic that defined the group (except Cluster 1). The next thing I wanted to determine was if there were any other attributes of these clusters that further support distinguishing them from one another? First I looked at location. How are these clusters distributed across the landscape? Unsurprisingly, all ten sites have features that are included in the Cluster 1 group. In fact, four of ten sites have features that only fall into Cluster 1. The other three clusters are more restricted in their distributions. Cluster 2 occurs at three sites, Cluster 3 is present at five sites, and Cluster 4 only occurs at two sites. These data suggest that across the region, the majority of the food-processing that occurred could be completed in a non-specialized, Cluster 1-type feature. This could be due to the relatively small amounts of food being processed in most features or to the predominance of certain foods that did not need a specialized surface. The next characteristic I wanted to examine were the use-wear patterns. Did each cluster have distinctive or diagnostic wear patterns that might help me interpret the types of food that were processed in those features? Before I start throwing terms at you, let me first explain a little bit about use-wear studies on ground stone surfaces. In regards to ground stone bedrock features, differential use-wear across the surface of a feature can show what type of activity happened most recently. Is the surface pecked and rugged, or is it completely smooth to the touch? These conditions tell different stories about what happened last with that particular feature. When making use-wear observations, the objective is to observe traits about the macrotopography, or the high and low points. Illustrations of ground stone use-wear patterns. Redrawn from Dubreuil (2004:Figure 1). Now going back to my data, the use-wear patterns further distinguished the Clusters from one another. Clusters 1 and 3 had very similar use-wear- they had rugged or pecked surfaces with either leveled or rounded high points. Cluster 1 feature walls was a rugged surface with either levelled high points or rounded high points. This suggests the area was first pecked to roughen the surface, and then different activities occurred to produce the modification on the high points of the feature. Levelled high points could have resulted from significant amounts of stone on stone contact (e.g., during fiber extraction), or if the processed material was hard in nature (e.g., seeds). In the instances with rounded high points, the surfaces were initially pecked, and then some sort of “soft” material was processed that smoothed the highs and lows of the peck marks. As the substance moved across the surface and around the high points, the surfaces became rounded. Softer materials potentially include a variety of plants (e.g., baked agave or sotol, nut meats, fruits) and animal tissue. Cluster 2 features, the somewhat deep ones, had mostly leveled surfaces on the walls with some gradual, smooth rounded high points. This suggests that materials being processed in these relatively deep features were somewhat abrasive nature, and that the individuals using these features did not feel the need to re-peck the sides of the shaft to roughen the surface. The intensive levelling of the walls also supports the probability of a rotary motion being used, as to increase the contact between walls and the material being processed. The most common use-wear pattern on the walls of Cluster 4 features are rugged upper walls and mostly leveled lower walls. This pattern suggests the upper walls did not come into contact with either the processing implement or the material being processed. Similar to the walls in Cluster 2 features, the lower half of these features must have been relatively full of semi-abrasive materials. This also suggests a pounding motion was utilized rather than a rotary or gyratory motion since the upper walls showed little signs of wear. However, two of the features in Cluster 4 are leveled on all portions of the walls throughout the shaft, suggesting a rotary motion may have caused the leveling. So to sum it all up, there are definitely different morphological types of bedrock features in the Lower Pecos. One of my original goals was to put forth a regional typology of bedrock features. Although the cluster analysis resulted in four highly different morphological groups, Cluster 1 includes an incredibly large range of feature sizes and makes up the majority of the data set. Until Cluster 1 is examined more thoroughly for intra-cluster pattering, I think it is premature to create a formal typology. Clusters 1 and 3 are both highly variable and elude a classification that can encompass all of the morphological and metric variation. Other groups (Cluster 2 and 4) are less variable and likely represent a true morphological and functional type. At this time, I will tentatively classify features in Cluster 1 and 3 as general grinding surfaces, features in Cluster 2 as conical mortars, and features in Cluster 4 as cylindrical mortars. Examples of bedrock features within each cluster: a) Cluster 1 features; b) Cluster 2 features circled in red; c) a Cluster 3 feature; and 4), Cluster 4 features circled in red. Behaviorally, the overwhelming presence of generalized features such as the ones in Clusters 1 and 3 makes sense for a mobile, foraging group. These features take very little time to create, and they were likely used to process many different foods, whatever the group could find on any given day. Other feature types (e.g., Cluster 2, conical mortars; and Cluster 4, cylindrical mortars) were highly specialized and only occurred at certain sites. This pattern could have implications about general lifeways for Lower Pecos hunter-gatherers. Perhaps these foraging peoples were using the many sites with general purpose features for a majority of the year, but sites with specialty features could signal use during certain times, such as a harvest or large social gathering. These theoretical ideas along with experimental work can help archaeologists push our interpretations of ground stone bedrock feature technology past just food processing and into theories regarding site reuse and optimal technological adaptations. Before I began my research, I expected the results to show many more distinguishable groups or morphological types. Undoubtedly, further analysis of the data will yield a greater insight into what morphological groups may be hiding in Cluster 1, which might change how I’ve interpreted the data thus far! There is so much more to learn, these types or groups are not set in stone…well they are, but you know what I mean. There are also other avenues to explore such as residue studies, which could give us an even better understanding of exactly what was processed in a feature. There are experiments to be done to figure out how long it takes to create a feature 50 cm deep in limestone! We’ve only just begun to peck the surface. But isn’t that the most exciting thing about archaeology? The more we learn, the more questions we have, and the whole process begins again. This blog post is meant to be a simplified summary, there is much more to this story! If you want to learn more about bedrock features in the Lower Pecos, you can download my full thesis from the Texas State Library webpage here. Dubreuil, Laure 2004 Long-term Trends in Natufian Subsistence: a Use-Wear Analysis of Ground Stone Tools. Journal of Archaeological Science 31:1613-1629. 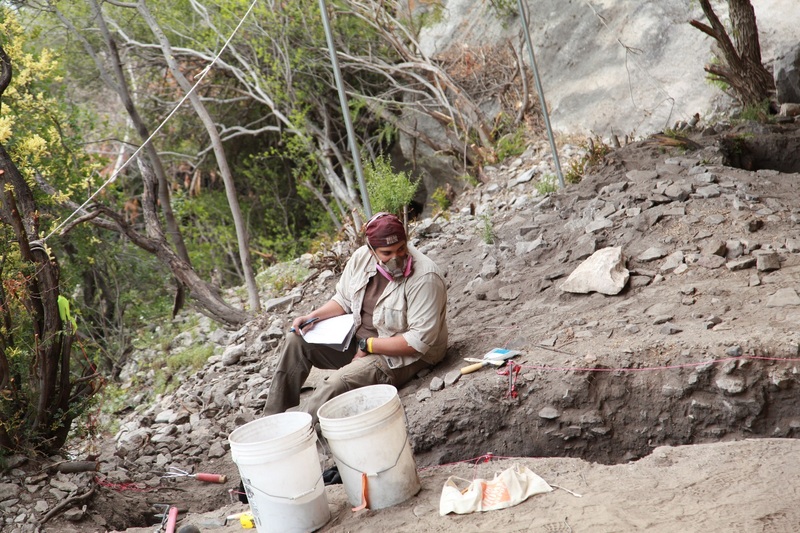 As you have learned from this blog, the 2014 Eagle Nest Canyon Expedition is a highly collaborative effort among many specialists and organizations, such as the Shumla Archaeological Research and Education Center (Shumla). Shumla is a non-profit research organization, based in Comstock, Texas, that has carried out archaeological research and public outreach programs in the Lower Pecos Region since 1998. Shumla’s archaeology staff has documented and helped preserve the fabulous rock art of the Lower Pecos using new, innovative, and creative methods that have set the international standard for rock art research. Charles Koenig, Steve Black, and Jeremy Freeman ponder what to do next in Skiles Shelter. We are looking into the main trench through the site. The white-brown contrast in the background marks the high water of the July 2010 flood when Hurricane Alex stalled over the region and dumped 10-15” of rain in just a few days. 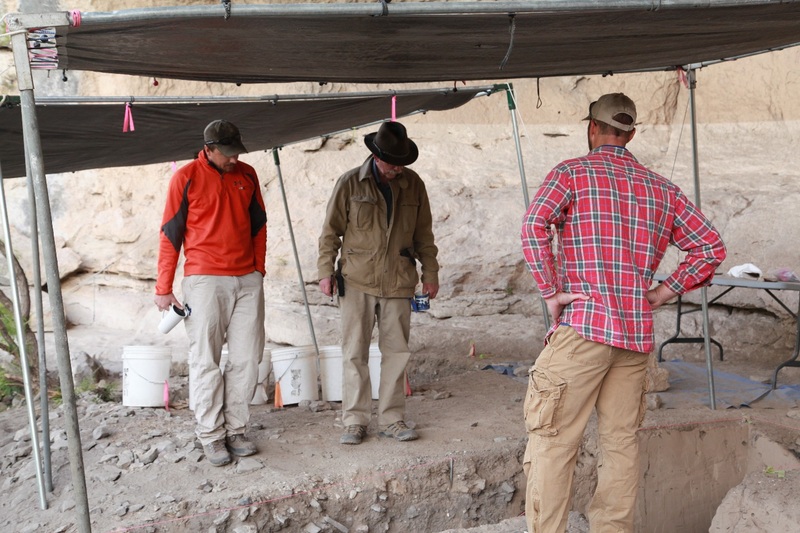 The inundation of this site, the lowest of the canyon’s rockshelters, highlights the ongoing threat and explains why we are digging extensively here. 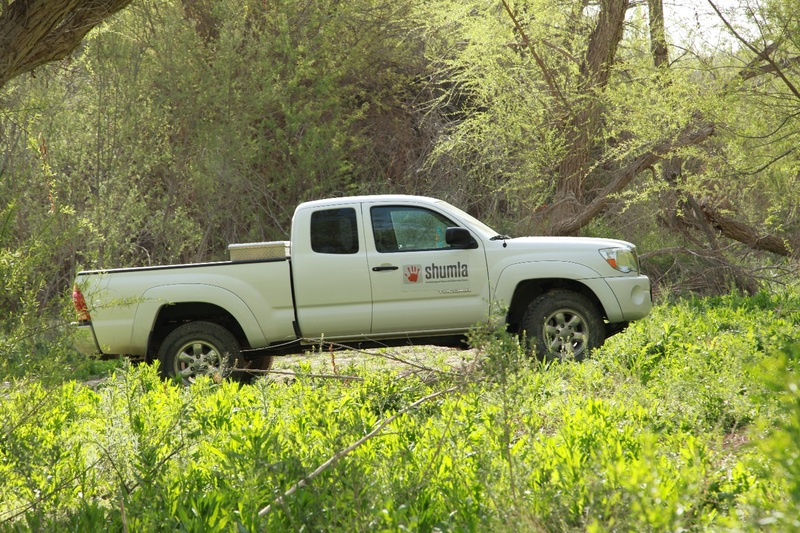 The Eagle Nest Canyon project is based at the Shumla Campus, and Shumla has loaned some of its equipment to the project, but perhaps Shumla’s greatest contribution is its personnel. Vicky Muñoz and I (Jeremy) are staff archaeologists at Shumla, and we have been helping out with the Eagle Nest Canyon project whenever we can. I did my undergraduate work at Heidelberg College and graduate work at Ball State University. I bring over 14 years of field experience to the project including: CRM projects, public outreach, academic research projects, and collegiate level-teaching experience. I have specialized in historical archaeology, and I bring that background to look into aspects of cognitive archaeology (as related to the rock art), the creation of a common identity, and understanding how people perceived the sacred landscape. Vicky is a recent Texas State graduate who attended Steve’s 2011 field school and has been involved with a number of ASWT projects. Vicky is very versatile, and is a pro with Shumla’s digital technology—from TDS to database programming. Vicky and I got our first taste of the Eagle Nest Canyon archaeology this past summer when Shumla and Texas State held a joint archaeological field school in Eagle Nest Canyon where students were afforded a unique opportunity to learn methods in dirt archaeology and rock art research. On the rock art side, field school students helped document the pictographs in Kelley Cave, Eagle Cave, Skiles Shelter, and Raymond’s Shelter by photographing, illustrating, and collecting attribute data on the figures, and analyzing the stratigraphic relationships of the pigments using a Dino-Lite digital microscope. Jeremy excavating a new layer of unit A-B at Skiles Shelter. The dust mask offers protection from the swirling clouds of fine powder spawned by troweling, screening, and merely walking through the shelter. Since January we have been working “in the trenches” alongside Texas State staff and volunteers. There are times when Vicky and I work directly with one of the Texas State staff members (e.g. taking notes, screening, excavating, etc.) and other times when we’re sequestered to work on a unit independently so the Texas State staff can focus on other work; Steve and Charles know well that they can count on us to excavate and document the units properly. 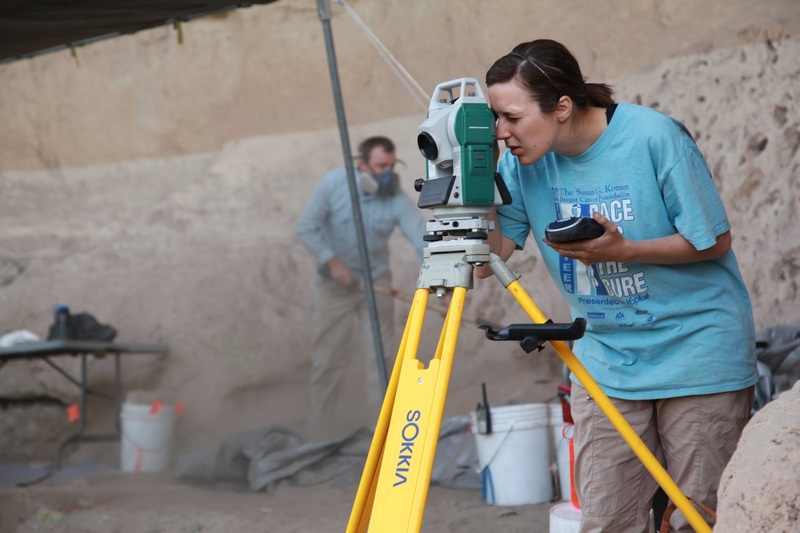 We’ve helped with everything from running the total station, to excavating burned rock middens on the canyon’s edge, to helping dig units into the shelter floors and talus slopes. And, last but not least, we have been assisting in taking the hundreds of sets of SfM photos to create 3D models of excavation units as well as that of Eagle Cave. We are pleased to be able to contribute our experience and expertise to the success of the project. Vicky Muñoz recording field notes on the north/south trench in Skiles Shelter. Notes are both hand-written and digitized. Vicky is almost directly under the shelter’s dripline. As you can see, the talus slope forms a “vertical” burned rock midden. Over several thousand years, hundreds of earth ovens were built near the front of the shelter and the spent rocks were tossed down slope. And only a few meters away (behind Vicky),are vivid polychrome Pecos River style pictographs. Excavating in the shelters of Eagle Nest Canyon has given me an opportunity to dust off my excavation tools and put them back in service. In fact, this is really my first time to work on burned rock middens! I had heard of them while working in the Midwest and Southeast, but had never had an opportunity to excavate one. It just goes to show that even after 14 years there’s always more to learn. The deposits in these shelters aren’t always clear cut, and subtle changes in the soil consistency may or may not indicate a significant layer. And, the rocks can make it very challenging to keep the walls straight, requiring painstaking trowel work to even the walls around the rocks. Digging through the dense deposits of burned rock often requires tools not typically in the archaeologist’s repertoire, such as garden claws and picks. These are faster than trowels and work better than shovels, which tend to get hung up on the rocks. Recently I spent a week excavating the tale end of Unit A-B at Skiles Shelter, which was opened as two side-by-side 1 x 1m units during the 2013 Field School. At the end of the season the units were terminated at a deep, thick layer some 1.5m below the surface that had a dense concentration of small roof spalls and very little cultural material. I’ve been using a pick and trowel to slowly work my way through the spall layer, which we hope may cover deeply buried intact cultural deposits, perhaps even Pleistocene-age deposits contemporaneous with Bonfire Shelter. Thus far, deposits dating before 9,000 years have been elusive in the other shelters in the canyon. Sadly, it looks as if the spall zone in the bottom of Skiles Shelter appears to be culturally sterile, although we haven’t quite reached solid bedrock yet. The roof spall layer likely formed gradually over an extended period of time on the original floor of the shelter before humans began visiting this locale. Brooke Bonorden using Shumla’s TDS (Total Data Station) at Skiles Shelter, which means that the Texas State TDS could to be simultaneously at Eagle Cave, several hundred meters up the canyon. Back to Shumla. Shumla’s collaboration with Texas State’s ASWT team offers a unique opportunity to integrate data from subsurface deposits (i.e. “dirt archaeology”) with rock art research. Traditionally there has been relatively little collaboration between dirt and rock art archaeological researchers, each using their own seemingly different methodologies to study “exclusive” aspects of the archaeological record. Only rarely have the data from each been combined for a more holistic interpretation. By studying both the “dirt” and “rock art” archaeology of Eagle Nest Canyon, we are taking a holistic approach to studying the archaeology of the Lower Pecos. This is made possible by the multi-disciplinary collaboration of different fields of study, including rock art research, archaeobotany, geomorphology, palynology, zooarchaeology, archaeoentomology, and dirt archaeology. Shumla shares in the belief that by taking a broad approach to studying the archaeology, we can learn more about the prehistoric people of the Lower Pecos through integrating diverse intellectual perspectives, methodologies, and complimentary lines of evidence to help us to better understand how people utilized the landscape throughout the region. Vicky and I are grateful for the opportunity to help with the ASWT project and are happy to offer our experience. We hope that our collaboration with Texas State will help both organizations meet our objectives and collectively bring greater insight into the prehistoric lifeways and landscape use of the region. Shumla returns to Eagle Nest Canyon amid the pale green colors of new spring growth.